Happy Halloween: Tales from the IP Crypt - Gottlieb, Rackman & Reisman, P.C. Halloween is a favorite and growing holiday. The National Retail Federation estimates that Halloween spending in the U.S. for the 2018 Halloween season will reach $9 billion. Helping to drive this market are the inventors, designers, and businesses who for more than a century have been working to provide holiday decorations, candies, and costumes, and also protecting their IP in these items. 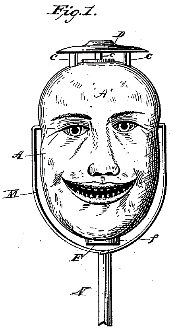 As far back as 1889, U.S. Patent No. 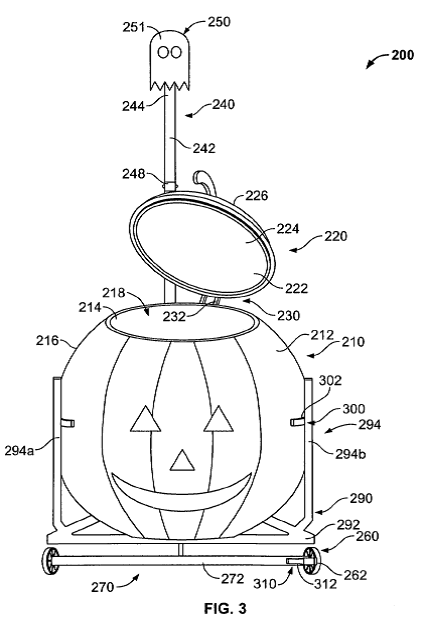 396,252 was issued for an improved Jack-O’-Lantern formed around a spring loaded candle lantern. Despite being nearly 130 years old, this design it would still be a terrifying addition to a haunted house today. One ubiquitous Halloween decoration is a carved jack-o’-lantern pumpkin. There have been many improvements in the pumpkin carving art over the years to make it easier. Many of these efforts involved variations of cookie-cutter and punch out forms, such as those in U.S. Patent No. 4,296,659. In the 1980s, the pumpkin carving industry was revolutionized by the development of special carving tools for making complex pumpkin designs. In 1989, Patent No. 4,828,114 was issued to Pumpkin Inc. (now called Pumpkin Masters) for a Pumpkin Carving Kit. The kit includes different sets of cutting tools, pattern sheets, and directions about how to transfer a complex design onto the surface of a pumpkin so it can be carved. As intricately carved pumpkins increased in popularity so did Pumpkin’s enforcement efforts. 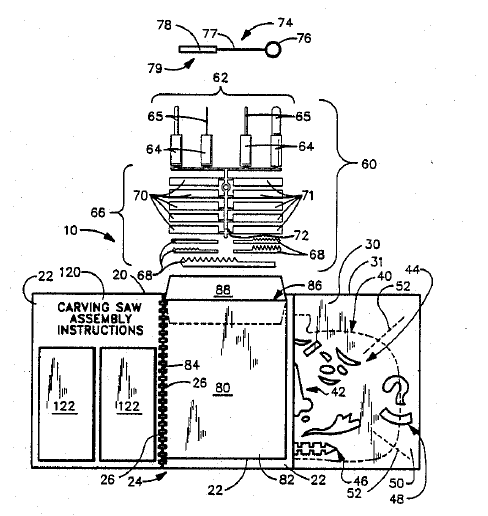 At least 50 lawsuits were filed from 1992 to 2002 to enforce patent rights to the carving kit, including lawsuits brought against Kmart, Kraft, Disney, Williams-Sonoma, and Martha Stewart Living Omnimedia. All of the disputes were apparently quickly resolved. Of course, carving real pumpkins still requires dealing with pumpkin guts and afterwards the creation slowly rots away. If you like pumpkin carving but not the mess, you can always use a carveable polyurethane foam pumpkin, such as disclosed in Patent No. 5,491,007. 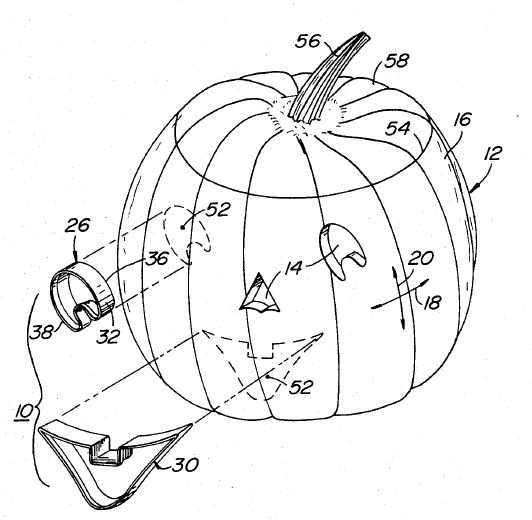 Halloween IP is not limited to patents. There are also many Halloween themed trademarks and candy is a popular item. The Jelly Belly Co. received Trademark No. 3,378,061 for “The Original Gourmet Candy Corn” while Russell Stover received U.S. Trademark No. 3,895,322 for its 1 Billion “In Goblin’s We Trust” Buster the ghost candy bar. Any house giving these out would surely be a popular stop. In the right markets, a Halloween prop can also serve as a trademark. U.S. Trademark No. 2,612,045 is for “fake severed heads for use as masquerade, Halloween, and haunted house accessories.” The mark is described as having “bulging eyes and a frightening demeanor.” According to the Trademark Office, the severed head mark is “Alive” although perhaps at this time of year, undead would be a better description. The trademarked severed head is that of Mr. Philip Morris Smith, a master magician and star of “Dr. Evil’s Horror Theater,” whose head presumably remained attached to his body throughout his life (except perhaps during his magic show). Mr. Smith was the founder of Morris Costumes. 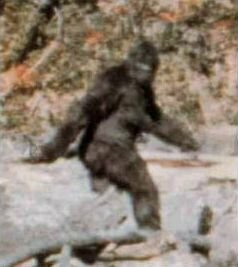 Among the many costumes he created was one for a customized gorilla costume sold to Roger Patterson in 1967 and that was (allegedly) worn later that year in Patterson’s famous Bigfoot sighting film. 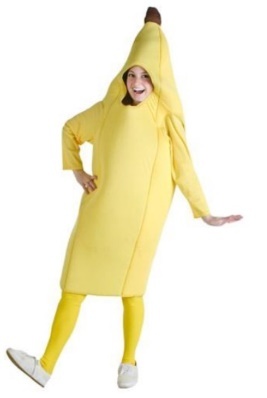 Speaking of costumes and props, various IP rights can apply to them as well. Patent No. 5,547,391 is for a tooth extension that can be anchored to a real tooth and appears like an animal fang. In January, 2011, the ‘391 patent and a corresponding design patent No. D589,509 for a “Pair of Artificial Fangs” was asserted against Billy Bob Teeth, Inc. and its Double Vampire Fangs product. The case settled in May, 2012. Having found that Rasta was likely to succeed in showing it had copyright protection, the court then held that Rasta was also likely to show improper copying because Kangaroo had access to the original work as a former reseller of the costume and because the protectable features in the two costumes were virtually the same. A preliminary injunction was issued earlier this year subject to a $100,000 bond posted by Rasta. An interlocutory appeal challenging the injunction is pending in the Third Circuit and opening briefs are due to be filed shortly. While intellectual property issues may seem scary, Gottlieb Rackman & Reisman is available to answer your questions and help protect your rights. 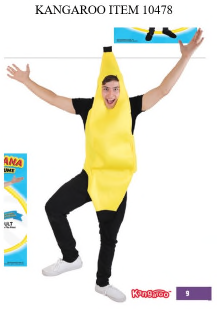 The examples here addressing Halloween-themed patents, trademarks, and copyrights are intended to be humorous but they illustrate the important fact that protectable and valuable IP rights can exist in a wide variety of products. As the market for holiday-themed products continues to grow, the importance of these rights will grow with it.